Buffalo Wild Wings is a restaurant chain that serves fried chicken wings with the same name. The nutritional information for Buffalo Wild Wings doesn’t vary significantly between restaurants but does depend somewhat on the type of sauce on the wings. Buffalo Wild Wings are generally high in protein and fat. The website My Fitness Pal provides nutritional information on Buffalo Wild Wings. It applies to wings with a vinegar and cayenne pepper sauce, the most popular sauce for Buffalo Wild Wings. The serving size for this information is 1 chicken wing. 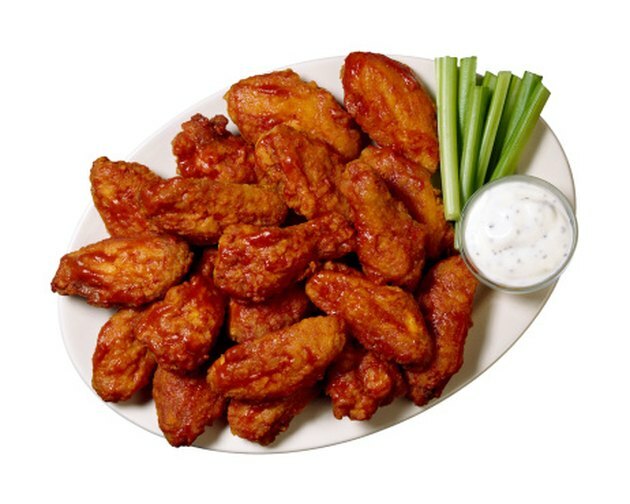 A serving of Buffalo Wild Wings has a total of 50 calories, or 2.5 percent of the daily value (DV) for total calories. This DV assumes a daily diet of 2,000 calories. Fat accounts for 27 calories, protein contributes about 20 calories and carbohydrates account for the remaining 3 calories. A serving of Buffalo Wild Wings contains 5g of protein, or about 10 percent of the DV for protein calories. It also contains 1g of carbohydrates, which is about 0.3 percent of the DV for carbohydrate calories. Buffalo Wild Wings don’t have any dietary fiber. A serving of Buffalo Wild Wings provides about 3 grams (g) of fat, which is 5 percent of the DV for fat calories. Saturated fat provides 1g of this total, or about 5 percent of the DV for calories from saturated fat. Buffalo Wild Wings also have 30mg of cholesterol, which is about 10 percent of the DV for cholesterol. A serving of Buffalo Wild Wings has 300mg of sodium, or about 13 percent of the DV for sodium. Additional nutrients in Buffalo Wild Wings include 1 percent of the DV for vitamin A, iron and calcium. A serving of Buffalo Wild Wings contains no vitamin C or potassium. Funding Universe: Buffalo Wild Wings, Inc.